Catching sarogi amazing occupation. In early spring, the roach rises to the upper reaches of the river, closer to pure streams. Upon the occurrence of a heat accumulated fish at the mouths of small rivers, obeying the instincts of the pack. These places often have to Wade through the flooded banks of course. To catch a Bursch in several ways. In the warm spring time, the use of donok pleasure. During this period, fishing is necessary to attach a small feeder to the main line. To ensure that the feeder does not pop up, lock her heavy weight. For snap donkey you will need a long elastic rod with a coil and a bell on the top. The feeder position at the base, but no closer than 20 cm from the hook. Choose a line 0.2 to 0.25 mm. At the end of the rope attach a swivel, which move the leash with a thinner fishing line to 0.18 mm. On the leash hook sharp hook. As the nozzle is perfect earthworms or maggots. It happens that the roach bite is good and the caddis worm, but the Frother will soon be useful during the posting of fish, as the Donk is still inferior in sensitivity usual float fishing rod, and, as a result, the nozzle will eat small bottom-dwelling fish. For feeding Soroki will fit a variety of cereals with the addition of boiled peas. The good is millet porridge. As well the fish likes the oatmeal, breadcrumbs and carefully crushed fried sunflower seeds. The method of fishing for sarogi relevant to the transaction, with strong currents, in the quiet solitudes of the river. At this time, the fish, crazed with fresh water, takes almost any bait. In this case, you must use light tackle when fishing. The presence of float required. The rod, do not select hard – tackle should not be very bulky. The fishing line will be thin, the hooks are small. For convenience, attach the fishing line to the float with a long antenna. 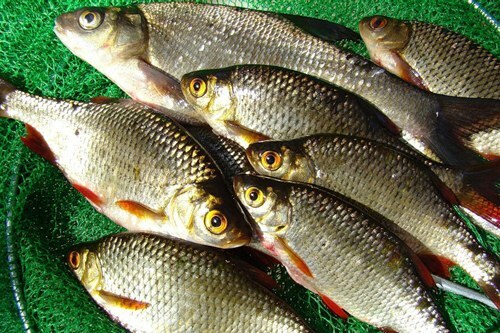 Many do not know that roach – evening fish, but it does not mean that it does not bite in the daytime. Just after a morning of intense bites often occur a long pause, and only toward evening, the biting starts again in full. Roach - fish is quite shy. It can alert even the quietest sounds.